Today’s recipe was not planned! It was one of those emergency recipes. You know the kind where you search through the refrigerator looking for what you can throw together in a pinch, and to boot the stores aren’t open? It was on Christmas day this recipe was born. Every year as a tradition, I buy Trader Joe’s Croissants to serve while opening presents. To make the croissants, the night before you just take them out of the package and let them thaw and rise. In the morning I brush them with egg wash and pop them in the oven. Presto! Good food and a happy family. Well this year I forgot to take them out of the freezer before bed. As soon as I got up I knew what I have forgotten to do the night before. I read the package and it says 7-9 hours to defrost. Sigh…. What do I do? No snack while opening presents? Then I remembered I had puff pastry in the refrigerator and thought I could make my own croissants. I placed flour on my pastry board, made the egg wash, turned the oven on and then I opened the package of puff pastry. Crappers, it was moldy! Now what do I do? I was just about ready to give up and I saw that I had a Pillsbury Pie Crust in the refrigerator. I thought, I wonder if I could make croissants with a pie crust? I’ve made Poptarts with them, why not give it a try? Well as you must know, they turned out perfect. 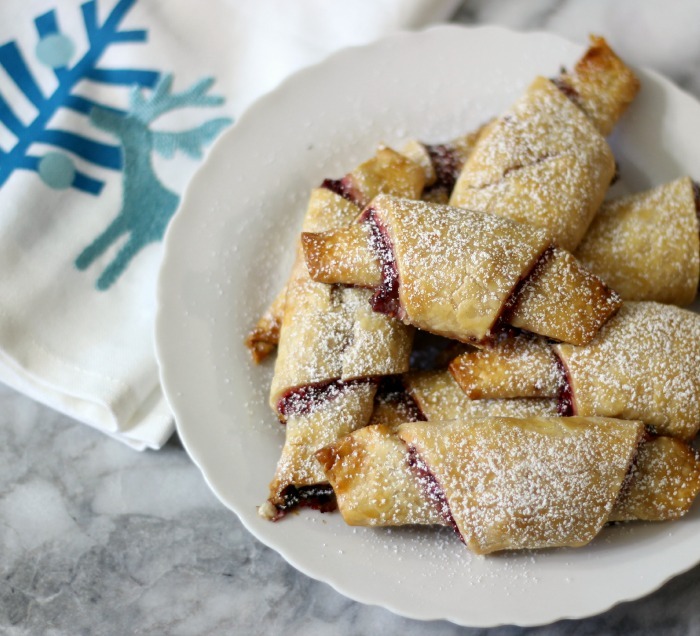 Not puff pastry, not croissants, but a wonderful sweet pastry to have while opening presents. Yeah! I saved Christmas, okay, maybe I’m going a little to far with that, but I did make a new pastry that I love! 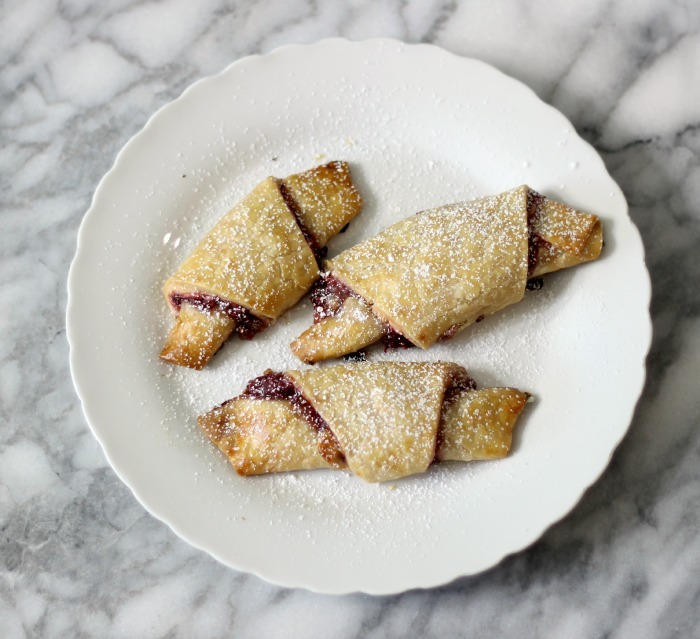 These little pastries are filled with cream cheese, berry jam and white chocolate chips. To give them a little bit of pizzazz I added powdered sugar to the top. I think it adds a nice extra little sweetness. For the jam I used my Chia Seed Berry Jam, but strawberry or especially raspberry would go wonderful. Raspberry and white chocolate go great together. Yum! To make the recipe, it is so easy! It will take you maybe 10 minutes tops to put it all together and then about 22 minutes to bake it. To make it, I rolled out my pie crust and with a rolling-pin, to flattened the edges. Then I lightly smeared the cream cheese that was mixed with vanilla extract to the dough. Then I topped the cream cheese with jam. With a sharp knife cut the dough into 8 slices. Then you will have 8 triangles. Sprinkled a little bit of white chocolate chips onto each triangle then roll up. Brush with egg wash and place in the oven and bake until lightly golden. Perfect! 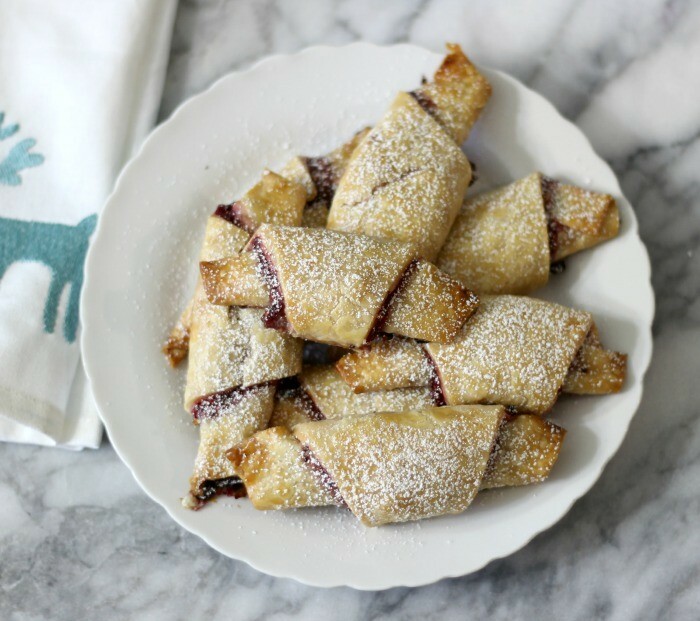 A sweet, light and flaky pie crust that is filled with cream cheese, jam and white chocolate chips. In a small bowl, beat egg and water; set aside. In a small bowl, mix cream cheese and vanilla extract until evenly combined. Cut pie crust into 8 wedges. Sprinkle a few white chocolate chips onto each wedge. Roll up each wedge, starting at the shortest side and rolling to the opposite point. Place the pastries, point side down, on the baking sheet. Brush the egg on the tops and sides of the pastries. Bake in oven for 20 - 25 minutes until golden brown. Let it rest for 10 minutes before serving. Sprinkle with powdered sugar if desired. You could use any kind of jam you like. 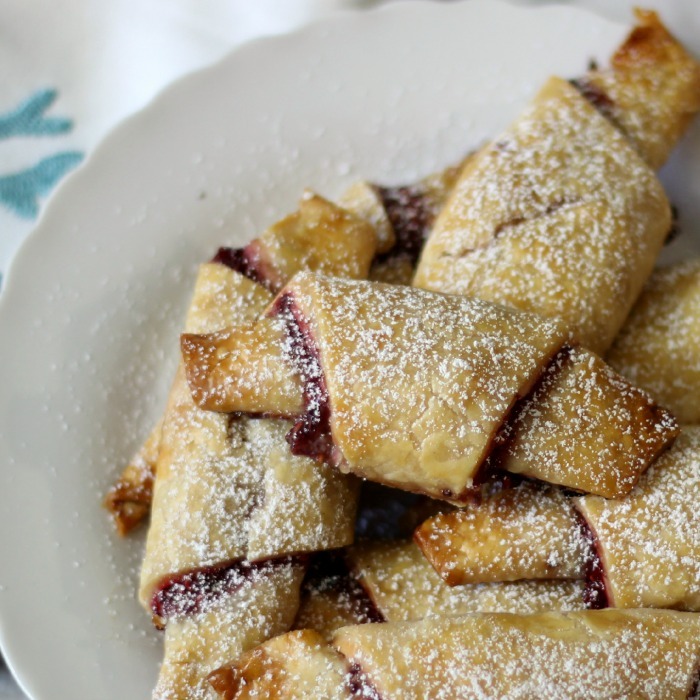 Raspberry, Strawberry or a Mixed Berry would go perfect with this recipe. 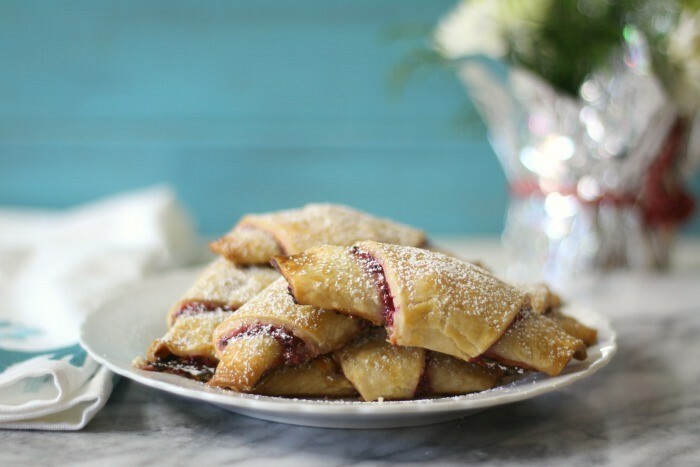 The pastry may crack a little when baking, the powdered sugar covers that up well. Trust me, know one knows. I thought this recipe was so easy, that I have a few other creations I want to try. Funny when you make a “Wing It” recipe they end up being the best ones. I have to admit those are my favorites! Have a great week! I am off this week, and plan on getting some much needed R&R. These look super delicious Jennifer! Hope you had an awesome holiday! Whoa you had a rough recipe day! But clearly everything worked out really well. I think you definitely saved the day Jennifer, these look wonderful!